UN Security Council considering resolution to authorize cross-border aid deliveries into Syria at four points without government consent. UN Security Council members are considering a draft resolution to authorize cross-border aid deliveries into Syria at four points without government consent, diplomats said on Thursday, according to Reuters. 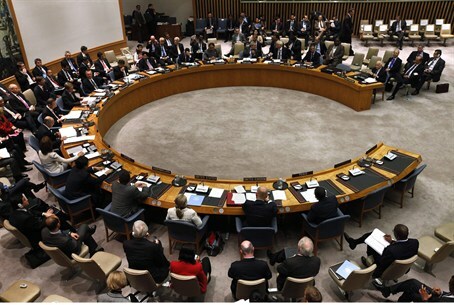 The 15-member Security Council achieved rare unity in unanimously approving a resolution in February that demanded rapid, safe and unhindered aid access in Syria. But deputy UN aid chief Kyung-wha Kang told the Council on Thursday that the resolution had failed to make a difference. About 9.3 million people in Syria need help and 2.5 million have fled, according to the United Nations. Council members Australia, Luxembourg and Jordan have drafted a stronger follow-up resolution that UN diplomats, speaking to Reuters on condition of anonymity, said would authorize deliveries into Syria at specific points from Turkey, Iraq and Jordan to reach millions of Syrians in opposition-held areas. “Ninety percent of the aid goes to government held areas, it's not getting to Syrians in zones which are controlled by the opposition,” Australian UN Ambassador Gary Quinlan was quoted as having told reporters after Kang's briefing. The resolution would threaten “measures” in the event of non-compliance, diplomats said. The draft has been circulated to the permanent five veto-wielding council members - the United States, Britain, France, Russia and China. Negotiations are due to take place among the eight members in the coming days. The draft text is under Chapter 7, diplomats said, which would make it legally binding and enforceable with military action or other coercive measures such as economic sanctions. The February resolution was binding, but not enforceable. Russia, supported by China, has previously vetoed four resolutions threatening any action against its ally, Syrian President Bashar Al-Assad. Most recently, Russia and China vetoed a resolution that would have referred the Syrian crisis to the International Criminal Court (ICC) for a probe into possible war crimes by both the Syrian army and the rebels. Moscow has previously made clear it was against allowing cross-border access without the consent of Syria's government, notes Reuters. The United Nations says it can only deliver aid into Syria without the government's approval under a Chapter 7 resolution. Diplomats said the draft resolution would likely be circulated to the remaining seven council members early next week ahead of a possible vote in early June. Russia assumes the rotating presidency of the Security Council for June.